At either end of a length of brake cable you need a ferrule. 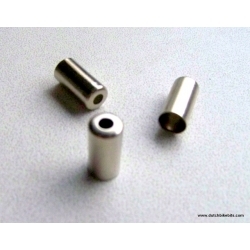 These have the standard inner and outer diameters of 5.1 mm (i.e. to fit 5 mm kabel) and 6 mm. If you replace your brake cables for both front and rear brakes, you will need four ferrules.